Max Lucado, with Randy Frazee, and Karen Hill, present three childrens book in The Story series includes thre wonderful stories to help kids the love God has for them. 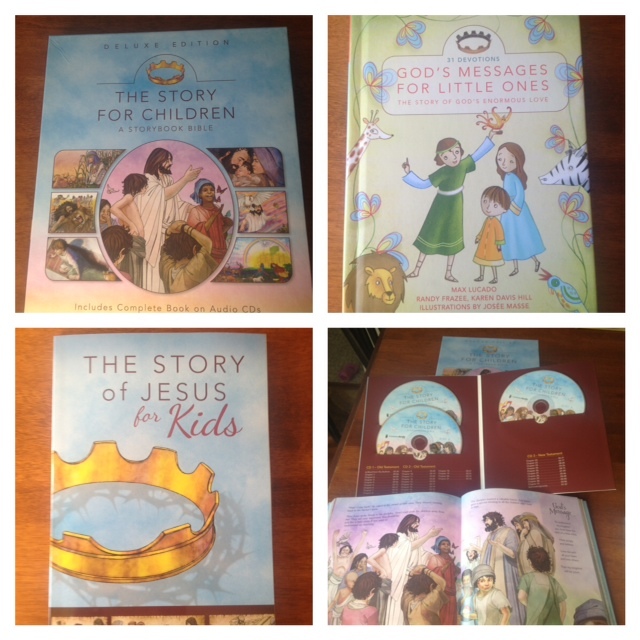 The three stories include: The Story for Children deluxe edition, God's Messages for Little Ones, and The Story of Jesus for Kids. This series would make a wonderful Christmas gift for any child! I really enjoyed Max Lucado's narration of the 48 different Bible Stories that have really been awesome at keeping my daughters attention. It is nice to have the CD's to listen to the stories but the book also provides great pictures with vibrant and detailed images that really please the younger ages. The Story of Jesus for Kids is a book for kids aged 9-12 that will help them develop their faith with a better understanding of Jesus. The paperback book has discussion questions for the kids.